I get super excited when i see club sandwich on the menu whenever i go out to eat. Apart from being really tasty, it's also filling and satisfying at the same time. 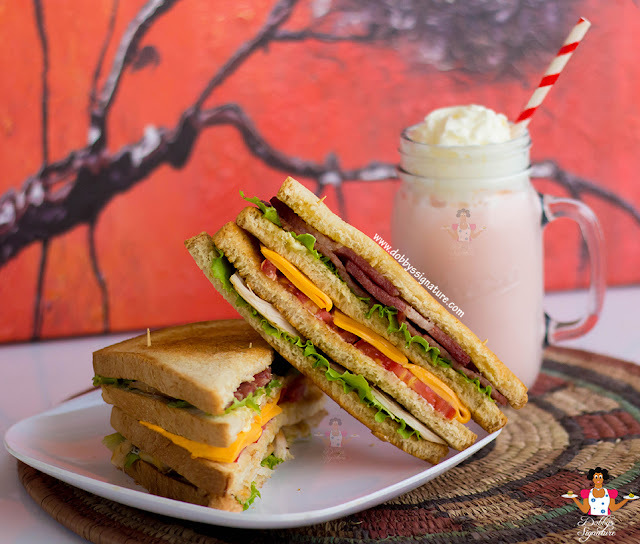 I don't make over the top sandwiches all the time at home but whenever i do decide to make it, i go all out by making a club sandwich. 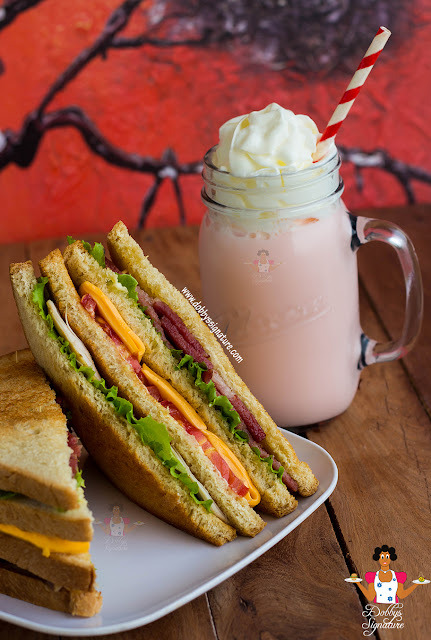 If you haven't noticed, there're only two types of sandwiches; the simple which is easily forgettable and the elaborate which would remain in your memory all day long. 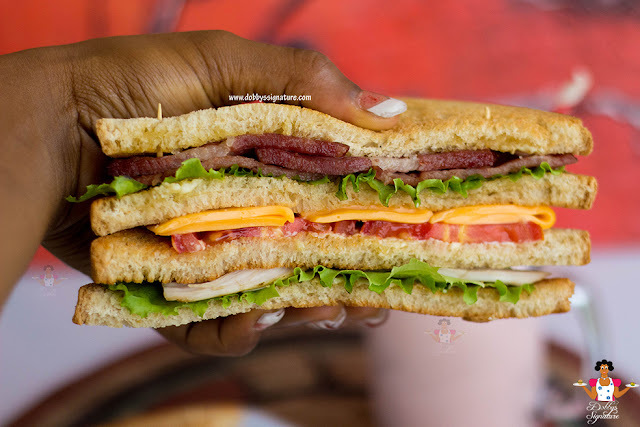 This sandwich right here is the type that remains in the memory for a long time to come. 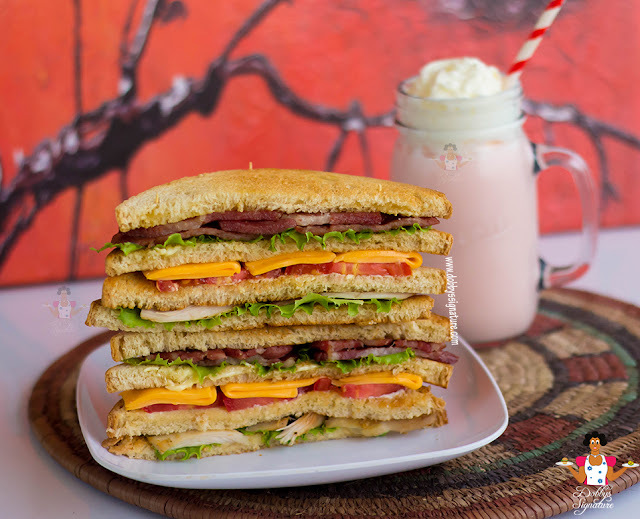 A club sandwich is a sandwich layered with toast bread, lettuce, mayonnaise, cheese, bacon, tomato, chicken/turkey. Some variations occur where egg or beef is used also. It's usually served with coleslaw or fried potato chips as a snack. Easiest thing to make at home, and so so delicious. A zillion times more exciting than a sandwich on plain ole bread and butter...Believe me! Step 1: Toast the bread in a toaster or on an empty pan on both sides. It's always advisable to use a perfectly squared bread for this sandwich. That way, once it's cut, you'de have two equal halves. Step 2: Rinse and place the bacon on an empty pan also. Do not add oil to it as bacon is really fatty and the oil which would be released from the fried bacon would be more than enough to cook it on both sides. Step 4: On a clean work surface, arrange 4 bread slices in a row. Spread 1 tablespoon mayonnaise over 1 side of each bread slice. For the first slice of bread, place the lettuce and shredded meat then top with the second slice of bread. On the second slice, place some slices of tomatoes and cheese then top with the third slice. On the third slice, place some more lettuce and bacon, then cover with the final bread slice..mayonnaise side down. Step 5: Pin the sandwich together by piercing all layers together with about 4 tooth picks in a diamond like pattern through the top bread slice. Step 6: Using a serrated knife cut each sandwich, diagonally, into 2 or 4 triangular pieces (each piece should be secured in the center with a tooth pick. Serve with potato chips and coleslaw or alone with hot or cold beverage. This sandwich looks so perfect and straight. i use egg for mine instead of cheese. Btw, i'm a silent follower and i love your blog. Thanks Lanre. Glad to have you here. So you think you can cook ehn? If you answer is YES then get in here ASAP and stand the chance to win £10,000. For details of how to submit, as well as terms and conditions, please follow this link. This sandwich is divine. Makes me want to break my fast. haha!!! please don't get tempted precious.